Crowned African Junior champion some nine months ago in Tunisia, Egypt´s Youssef Abdel-Aziz emerged the player to cause the biggest upset as play commenced in the group stage of the Boys’ Singles event at the Luxembourg 2017 ITTF World Junior Circuit Finals on Friday 2nd January. The no.10 seed, he accounted for Kanak Jha of the United States, the top seed, in seven games (5-11, 13-11, 11-3, 7-11, 6-11, 11-6, 11-7) to make the perfect start in his quest for a place in the quarter-finals. 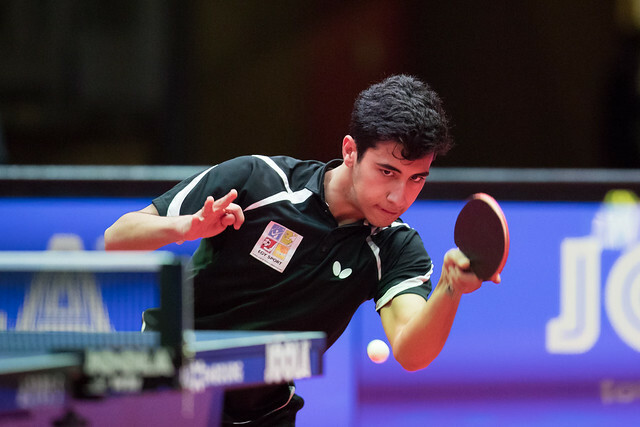 An upset but perhaps not such a major a surprise as one may think; the two met three years ago in January 2015 at the 2014 ITTF World Junior Circuit Finals in the Paraguayan capital city of Asuncion; similarly, Youssef Abdel-Aziz prevailed in seven games. Defeat for one notable name and there was defeat for another in the opening matches in the Boys’ Singles event, a success against the odds that brought smile to the hosts; Luxembourg’s Ademir Balaban, the no.15 seed, overcame Russia’s Artur Abusev, the no.8 seed (11-6, 11-7, 12-10, 11-8). Problems for Artur Abusev, conversely in the same group, there were no such difficulties for Romania’s Cristian Pletea, the no.2 seed, he beat India’s Manush Utpalbhai Shah, the no.9 seed (11-4, 5-11, 13-11, 11-9, 11-8) to make the ideal start to his campaign. Impressive from Cristian Pletea; for colleague Rares Sipos and Manav Vikash Thakkar, like Manush Utpalbhai Shah also from India, there were positive starts. Manav Vikash Thakkar beat Austria’s Maciej Kolodziejczyk, the no.12 seed (2-11, 11-3, 2-11, 11-2, 11-5, 11-5); Rares Sipos, the no.4 seed, accounted for Argentina’s Francisco Sanchi, the no.11 seed (11-5, 11-8, 11-3, 11-3). Play in the second series of matches in the group stage of both the Boys’ Singles event will be completed later in the day.